Dean Radin, Director of Research at the Institute of Noetic Sciences (IONS) and bestselling author of The Conscious Universe, presents persuasive new experimental evidence for the existence of such phenomena. 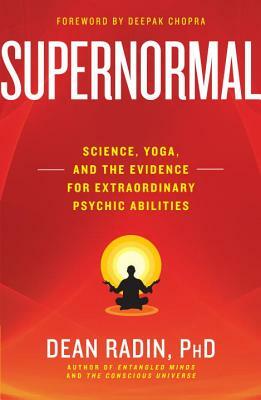 He takes us on a thrilling scientific journey and challenges outdated assumptions that these abilities are mere superstition. Focusing on Patanjali's mysterious Yoga Sutras -- 2,000 year-old meditation practices believed to release our extraordinary powers -- Radin offers powerful evidence confirming that sometimes fact is much stranger, spookier, and more wonderful than the wildest fiction. Dean Radin, PhD, is the author of Entangled Minds and The Conscious Universe. For more than two decades he has been engaged in research on the frontiers of consciousness. He has held appointments at Princeton University and several Silicon Valley think tanks, including SRI International, where he worked on a classified program investigating psychic phenomena for the US government. "In the last 50 years, major discoveries in modern science increasingly support the wisdom and vision of the ancient philosophers and sages. Dean Radin’s work is a major step in the same context, showing us how the statements made by the ancient sages like Patanjali are supported by the current research conducted with strictest scientific protocols. Radin’s work seems to bear even greater promise of what is yet to come." --Swami Veda Bharati, D. Lit.